28693 – IOException: kqueue() FileSystemWatcher has reached the maximum nunmber of files to watch. Bug 28693 - IOException: kqueue() FileSystemWatcher has reached the maximum nunmber of files to watch. We need a better repro than using dnu restore/dnx kestrel because those stacks are too large and I have failed repeatedly at getting them working with my custom build of Mono. The resources on the web are also lacking. @Miquel de Icaza - https://github.com/aspnet/Home/issues/508#issuecomment-122305412 This comment mentions the scenario can be repro'd using Gulp and Sass. Is dnu restore/dnx kestrel still not working for you? I can help you get them working if you give me the error you are encountering..
whereas the equivalent on .Net on Windows 10 (i.e. 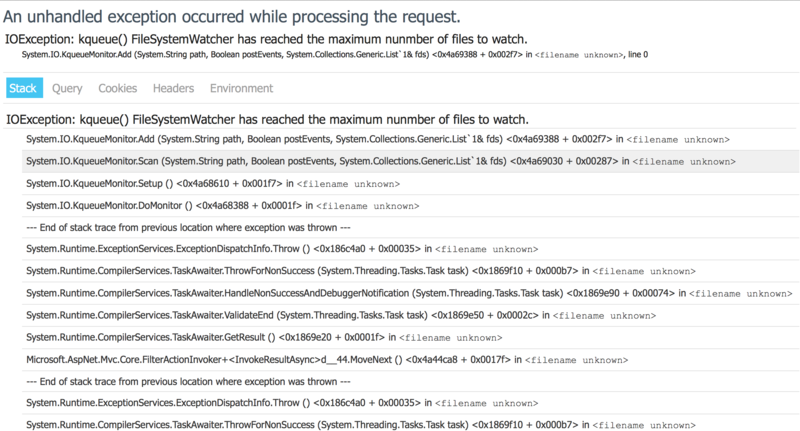 watcher.Path="\\") works fine. Sorry let me be more precise. That was with mono version 4.2.0. If you omit EnableRaisingEvents, then it doesn't throw. I get this using dnx-watch kestrel. Running dnx kestrel works fine. In my case the workaround was to put my code into a src folder and run dnx-watch there instead of at the root. The result of that was the exclusion of the .git folder in the root, which I assume was the problem since my project is quite small at this point. Most .NET 5/MVC 6 developers will run into this limit due to the large number of files added to the bower_components and npm_modules folders. This is most likely a limit imposed for some performance reason, but it would be great if someone on the Mono team could provide more feedback. Fixed, the limit is gone. I have checked this issue with latest C6SR1 Mono  MonoFramework-MDK-4.2.2.18.macos10.xamarin.x86_d35418ca2aa7a45a882d6df7a63a371f0d10e251 using code snippet given in comment(5) and observed that Now no exception is raising on watcher.EnableRaisingEvents = true.